Israel Indicts U.N. Employee, Accuses Him Of Helping Hamas : The Two-Way The indictment comes just days after Israel charged a World Vision employee of funneling millions to the militant group in charge of the Gaza Strip. 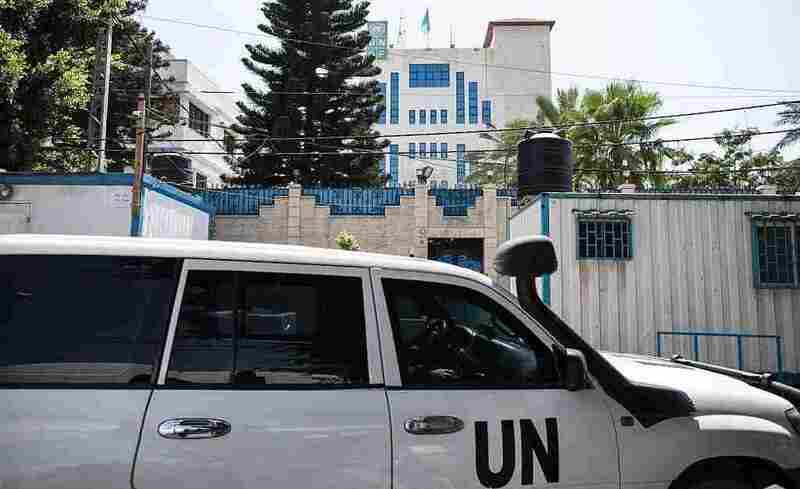 Palestinian staff of the United Nations Development Programme drive an official car in front of its headquarters in Gaza City on Tuesday. Israel indicted an employee of the United Nations Development Programme on Tuesday, alleging that he helped the militant group Hamas. This news comes just days after Israel accused a World Vision employee of funneling millions to Hamas, which controls the Gaza Strip. "The Shin Bet claims that in 2014 Burish was instructed by Hamas to apply for an engineer position at the UN Development Program in charge of renovating houses damaged during conflict with Israel. "According to the Shin Bet, Burish abused his power to help Hamas, either by renovating their houses or informing them of such renovations when they held benefit for the group. For example, he allegedly informed Hamas that armaments or tunnel entrances were found in homes under the UNDP's authority so that the group could commandeer the site, in clear contradiction of the UN organization's mandate. The Shin Bet also accuses Burish of creating a makeshift dry dock in Gaza for Hamas using UN resources." The Associated Press reports that the UNDP issued a statement saying the agency was "conducting a thorough internal review of the processes and circumstances surrounding the allegation." Hamas called the claims "baseless." As The Two-Way reported last night, World Vision has cast doubt on Israel's accusations, saying they seemed implausible. Israel, for example, says World Vision's Gaza director, Mohammad El Halabi, diverted up to $50 million to Hamas, but World Vision says it's entire operating budget in Gaza during the past 10 years adds up to about $22.5 million. "World Vision's accountability processes cap the amount individuals in management positions at his level to a signing authority of $15,000," said Kevin Jenkins, president and CEO of World Vision. A previous version of this post misidentified World Vision's CEO as Keith Jenkins. He is Kevin Jenkins.